Stop feeding birds and pests! Feed only your chooks with our automatic treadle chicken feeder and drinker. The only free-range treadle drinker and feeder on the market! Two-in-one option, saves you the need for buying multiple drinkers and feeders. The Best Treadle Feeder & Drinker on the Market! 1. Soft close lid won’t slam shut & harm your hens. 2. Safety side guards to prevent hens getting their head stuck. 3. Metal grill stops excess food being flicked out & wasted, saving you money. 4. Two step training bolt helps hens learn to use the feeder faster. 5. Locking pin for night time security from pests. 6. Holds 9kg of feed or 6.8L of water with 3 removable food grade containers. 7.Non-slip treadle used to access feed & water. • Soft closing hinge ensures chickens do not get hit by lid when stepping off treadle step. • Chickens aren't frightened off by lid slamming noise as they are with other models. Save time constantly refilling feed! A full feeder will feed 4 Chickens for over a week! Get Creative! Set Up a Buffet! • Individual containers provide your chickens with access to fresh food and water from individual compartments. • Use the three separate compartments to provide a mixed selection of nutritious treats for you chooks! • We love Mealworms, oats, lay mash & greens. The Free Range Feeder & Drinker is suitable for large chickens, small bantams and other poultry birds. Stops injury to chickens attempting to feeding from sides. Featuring long lasting, rust-proof aluminium, this feeder is a breeze to clean. Save valuable feed from rats, mice and birds with the night time securtiy locking pin! • Deter your chickens from flicking and spilling their feed with the added metal grill bars. • Reduces feed wastage by 75%! Prevent water from being soiled and contaminated. Keep chicken feed dry! The feeder is delivered in raw aluminium so you can paint it to match your coop with metal paint & primer. • Most chooks learn to use it in no time at all! • Takes just 5 minutes to assemble! Download your FREE brochure to learn more about our Treadle Feeder and Drinker. How long does it take to train them to use it? Will it hurt my chickens? Not at all! 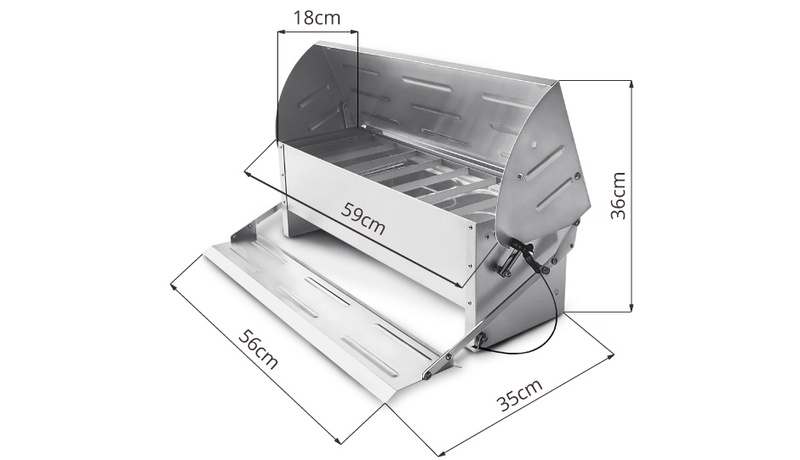 We have designed the feeder to be completely safe for your chickens. Can my bantams/silkies use it? They sure can! It opens with 500 grams of weight on the tread pedal. What if my chickens are scared of it? While some chickens may initially be scared of the feeder, it is more so because it is new to them, and once they become familiar with the feeder, and realise this is their food source, it will soon become their favourite! We find popping their favourite treats in the treadle feeder to begin with always helps.